Tripp Lite's 1.83 m (6-ft.) DVI Single Link Cable delivers the high performance and high bandwidth needed for today's digital video displays. Gold-plated contacts ensure excellent conductivity, while double shielding (foil and braid) provides maximum EMI/RFI protection. Both DVI connectors are molded and have integral strain relief for long life reliability. Tripp Lite’s 6 ft. DVI Single-Link TMDS Monitor Cable delivers peak performance to DVI-enabled flat panel displays, CRT monitors and projectors at resolutions up to 1920 x 1200 and transmission speeds up to 4.95 Gbps. Compatible with computers equipped with a DVI-D female port, this cable’s long 6 ft. length allows the video source to be out of the way so the focus remains on the connected display. The P561-006 is manufactured using top-quality materials. It has dual ferrite chokes and premium double-shielding with foil and braid for maximum EMI/RFI protection and superior signal quality. The P561-006’s molded gold-plated connectors have gold-plated copper contacts for optimal conductivity, while integral strain reliefs provide enhanced durability and long life. For peace of mind, the P561-006 comes backed by a lifetime product warranty. It’s manufactured in compliance with strict RoHS specifications, reflecting Tripp Lite’s commitment to environmental responsibility. 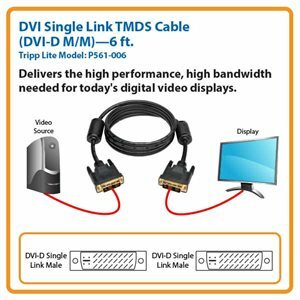 DVI Single-Link TMDS Monitor Cable (DVI-D M/M), 6 ft.